Interstate 505, the Industrial Freeway, was a planned 3.17-mile spur from I-405 along the U.S. 30 corridor in northwest Portland. The Industrial Freeway was conceptualized as early as 1959 and 1963. AASHTO approved the I-505 designation on June 23, 1969 and the Interstate highway was proposed in 1971 as a 1.3-mile long facility. Controversy involving the construction of I-505 ensued. A lawsuit demanding an environmental study was presented to the U.S. District Court in 1971, and it was debated through the rest of the decade. Plans for Interstate 505 called for the western terminus to be at the St. Johns Bridge approach (U.S. 30 Bypass). This landmark bridge, built in 1931, would possibly have had its western approach modified to meet the proposed Interstate highway. Photo taken 09/02/06. Source: Interstate 50th Anniversary: The Story of Oregon’s Interstates. 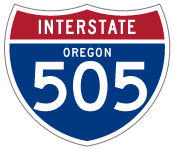 The state of Oregon redirected federal Interstate dollars allocated for I-505 for an array of projects. These included funds for completing Interstate 205, Portland area highway improvements on U.S. 26 (Sunset Highway), Oregon 212, and Oregon 217 and other roads, and construction of mass transportation systems including the “Banfield Transitway Project”. Eastbound U.S. 30 reaches N.W. Yeon Avenue near Forest Park; the US route shifts onto a brief freeway alignment that was to be a part of Interstate 505 until that freeway was eliminated in the Oregon Freeway Purge. Photo taken Chris Elbert (05/28/05). The short freeway proceeds one-half mile to the exchange with Interstate 405. Photo taken 09/02/06. The U.S. 30 freeway continues east from Vaughn Street to I-405 (Stadium Freeway). U.S. 30 eastbound transitions onto northbound Interstate 405 ahead. Photo taken 08/27/06. Interstate 405 south links with U.S. 26 west as well as Interstate 5 south to Eugene. Photo taken 08/27/06. Taking the ramp from U.S. 30 east to Interstate 405 south in Portland. Photo taken Chris Elbert (05/28/05). Northbound Interstate 405 reaches the off-ramp (Exit 2B) to Everett Street. The succeeding exit is for U.S. 30, which would have been Interstate 505 had the rest of the freeway been built to the west. Photo taken 08/27/06. A series of overpasses span Interstate 405 as the freeway passes just west of Downtown Portland. Exit 3 departs next from the left lanes to U.S. 30 westbound. Photo taken 08/27/06. The left lanes will transition directly onto westbound U.S. 30, which travels west along Yeon Avenue, past Forest Park, and on to St. Helens Road. Photo taken 08/27/06. Northbound Interstate 405 splits with westbound U.S. 30 and the planned I-505 freeway. The northbound lanes transition to the lower deck of the tied arch Fremont Bridge over the Willamette River. Photo taken 08/27/06. U.S. 30 extends northwest from Portland to Astoria, where the coast to coast highway ends at U.S. 101 near the mouth of the Columbia River. Photo taken 08/27/06. Interstate 405 south and U.S. 30 west travel the upper deck of the Fremont Bridge across the Willamette between Interstate 5 and their split at Exit 3. U.S. 30 leaves the Portland urban loop via a short freeway spur that was to be part of planned Interstate 505. Photo taken 09/02/06. 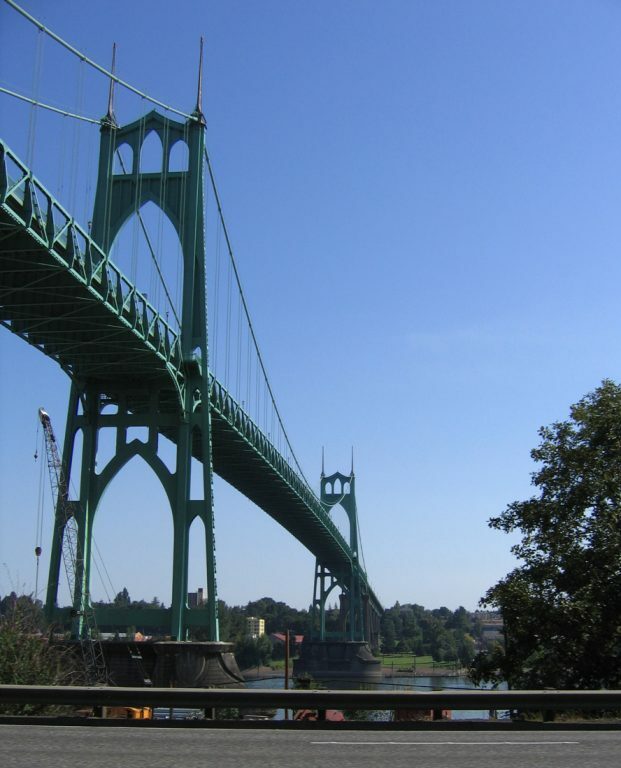 The Fremont Bridge is the largest tied arch bridge on the Interstate Highway System, with a much higher span than comparable bridges elsewhere in the system. The Interstate 405 and U.S. 30 split is at the south end of the main span. Photo taken 09/02/06. The freeway spur of U.S. 30 travels approximately 0.6 miles between Interstate 405 (Stadium Freeway) and Vaughn Street. Photo taken 09/02/06. Traffic from Interstate 405 northbound joins U.S. 30 westbound ahead of the half-diamond interchange with Vaughn Street. Vaughn Street represents the original U.S. 30 alignment from here west to N.W. St. Helens Road. Photo taken 09/02/06. U.S. 30 transitions into N.W. Yeon Avenue at forthcoming Nicolai Street. Prior to the completion of the Interstate 505 freeway ramps, U.S. 30 traveled along Vaughn Street just south of the Montgomery Park building. A former Montgomery Ward Distribution Center built in 1921, Montgomery Park today is an office building renovated in 1989. Montgomery Park is the second office building by volume in Portland.4 Photo taken 09/02/06. The U.S. 30 freeway proceeds another half mile beyond the Vaughn Street off-ramp. Photo taken 09/02/06. A traffic signal marks the end of the U.S. 30 freeway. Interstate 505 would have continued northwest from here along U.S. 30 through the N.W. Industrial Area. Photo taken 09/02/06. The left lane will turn onto Nicolai Street westbound, while the auxiliary right lane turns onto Nicolai Street eastbound. Two lanes continue west along U.S. 30 to the N.W. Industrial Area, the St. Johns Bridge, and St. Helens via Yeon Avenue. Photo taken 09/02/06. The freeway spur ends here at this traffic signal with Nicolai Street. U.S. 30 (Yeon Avenue) turns northwest through industrial and port areas as it follows the Willamette River northwest toward St. Helens. Photo taken 09/02/06. Eastbound U.S. 30 approaches the intersection with Nicolai Street (one-half mile). This marks the beginning of the freeway spur that was constructed. Photo taken 09/02/06. Both lanes of Yeon Avenue merge onto the freeway spur after passing through the Nicolai Street traffic signal. Photo taken 09/02/06. Omitting any mention of U.S. 30, an Interstate 405 trailblazer directs motorists on Nicolai Street eastbound to the short spur section of Interstate 505. Photo taken 09/02/06. Westbound Nicolai Street meets U.S. 30 (N.W. Yeon Avenue) at this traffic signal. The short freeway spur begins to the left, while the proposed Industrial Freeway (Interstate 505) would have traveled northwest toward the St. Johns Bridge. Photo taken 09/02/06. After traveling through the N.W. Industrial Area for a couple miles, westbound U.S. 30 approaches Bypass U.S. 30 and the St. Johns Bridge, where Interstate 505 would have ended. Photo taken 09/02/06. The ramp onto St. Johns Bridge northbound is via this left turn. Bypass U.S. 30 is not signed in this direction. The suspension bridge comes into view in the distance with its distinctive green towers and supporting cables. Photo taken 09/02/06. Traveling west on Bypass U.S. 30 across the St. Johns Bridge, the junction with unconstructed I-505 would have been located at he south end of the spane. Instead, the bridge connects directly to U.S. 30 near Forest Park. The St. Johns Bridge was painted green by David B. Steinman to promote harmony with the forest-covered hills on the southern bank of the Willamette River.3 Photo taken 09/02/06. The St. Johns Bridge is a suspension bridge that carries Bypass U.S. 30 over the Willamette River. This is the northernmost bridge over the Willamette River before it merges with the Columbia River. Built in 1931, the St. Johns Bridge deck was rehabilitated in 2005. The bridge rises 205 feet above the navigable waters below, and it has a main span of 1207 feet. It was designed by David B. Steinman and is one of three major suspension bridges in the state of Oregon (none of which are on the Interstate Highway System).3 Photo taken 09/02/06. At the end of the four lane, undivided St. Johns Bridge, Bypass U.S. 30 ends at U.S. 30 east to Downtown Portland via St. Helens Road and Yeon Avenue and U.S. 30 west to Astoria. Photo taken 09/02/06. Interstate 505 would have begun near along U.S. 30 at the junction with Bypass U.S. 30 (St. Johns Bridge). The first advance sign for the St. Johns Bridge appears a half mile out. Photo taken 09/02/06. Eastbound U.S. 30 and Bypass U.S. 30 split here. Bypass U.S. 30 crosses the St. Johns Bridge to Germantown Road. U.S. 30 follows St. Helens Road to Yeon Avenue into the Northwest Industrial Area. Interstate 505 would have begun at or near this point. Photo taken 09/02/06. Chris Elbert, email: “Re: NW Interstate Updates at Interstate-guide.com.” March 16, 2005.